Lay out tortilla on a clean surface. 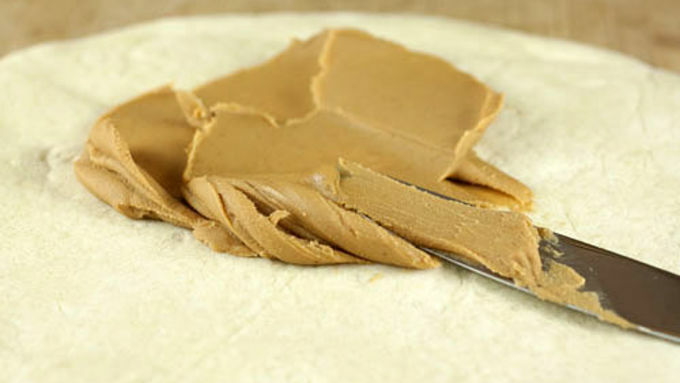 Add 1/4 cup peanut butter or cream cheese. Spread first filling thinly over tortilla. Then add a layer of Nutella™ (1/4 Cup). Spread thinly. 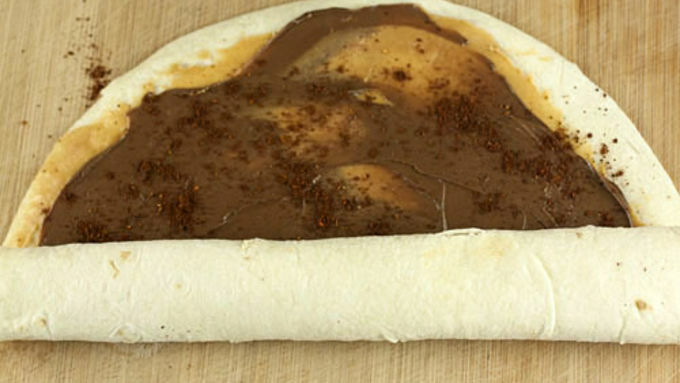 Add desired toppings: Chili powder and orange zest goes well with peanut butter and nutella. Strawberries go well with cream cheese and Nutella™. Roll tortilla up tightly but not so tight that the layers squirt out. Slice the tortilla into 8 pieces and discard (eat) the ends. You should end up with 6 pieces from each tortilla. If you want to make them in advance, chill them whole and slice them right before serving. 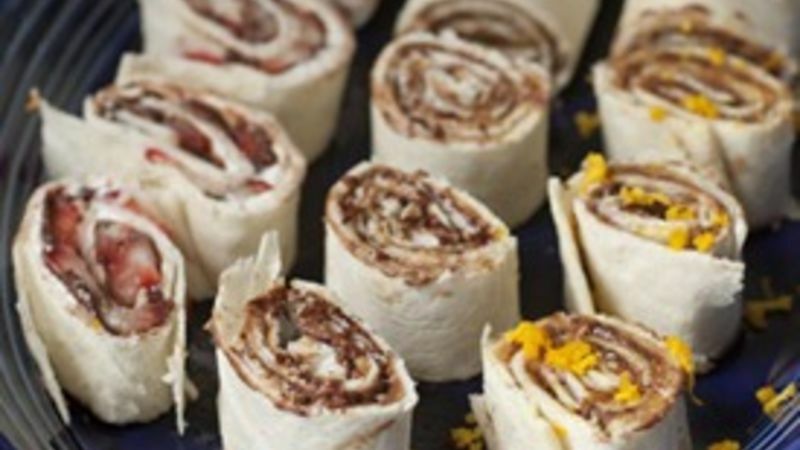 Garnish chili powder pinwheels with extra chili powder and orange zest pinwheels with more orange zest. When I was a kid my mom used to make me these special trays called “everything plates” on the weekends. As you might guess, the plates were a huge pile of cheeses, veggies, and dips. They were literally a little bit of everything. In hindsight, I’m pretty sure she was using me as a vacuum for leftovers. The centerpiece of these “everything plates” was almost always some sort of pinwheel. My mom was pretty creative as to what she could layer inside a tortilla and roll up. These dessert pinwheels are homage to those everything plates that I loved so much growing up. For this post I made three different kinds of dessert pinwheels. All of them taste very different even though they have at least one ingredient in common. I used peanut butter, cream cheese, orange zest, strawberries, and chili powder. Oh and lots of chocolate hazelnut spread because that just goes well with everything. 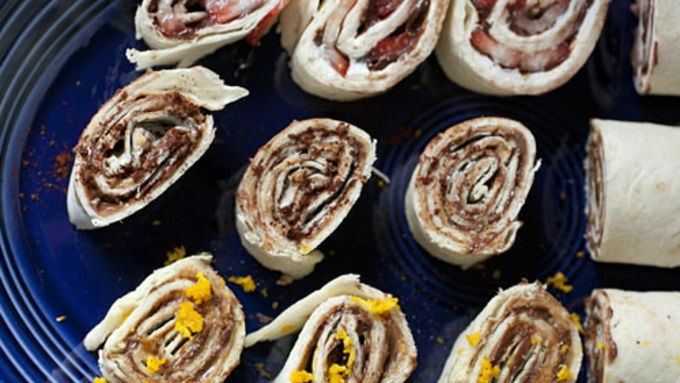 When it comes to making a good pinwheel, the key is to not use too much filling. A little goes a long way. 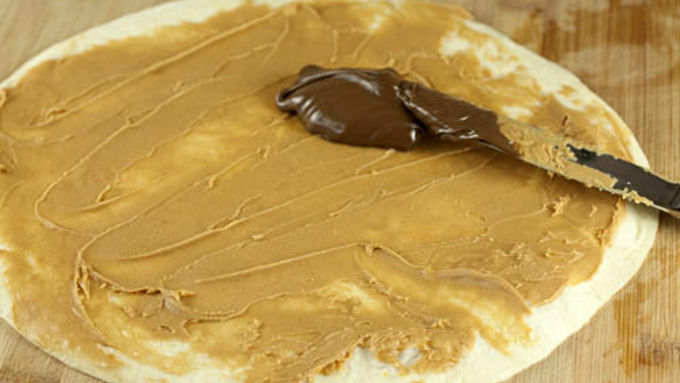 I use about a quarter cup of peanut butter (or cream cheese) for a whole tortilla. And the same amount of chocolate spread. The idea is to have a very thin layer of each ingredient. If it’s too thick then the filling will squirt out all over the place when you try to cut it. When it comes down to variations, the options are really endless. Here are three of my favorites that I’ve been experimenting with. Chili powder is a savory ingredient but it works really well with chocolate. It’s actually a very subtle flavor in the pinwheel because the other layers are so intense, but I really like it. Any kind of citrus zest is always fun to put in a pinwheel like this. What’s nice about the zest is that it doesn’t take up much room, but delivers big in the flavor department! I used orange zest for this variation, which goes incredibly well with both the peanut butter and chocolate flavors. Just be sure to zest off only the outer layer. Don’t dig down to the white part (pith). For the strawberry one I switched the base layer to cream cheese instead of peanut butter. Strawberries are a pretty light flavor so the cream cheese just works better. Just to bump up the flavor a bit more, I dusted my chili powder ones with a little extra spice and hit my orange pinwheels with some fresh zest. For about ten minutes of work, these taste pretty outstanding. I think kids would love these (well, maybe not the chili powder one), but honestly I loved these also. They are perfect for a quick dessert and you can just cut a pinwheel or two off of the main roll and store the rest for later!